The confusion between beautiful and gorgeous has always been rife. As such, most are the times when one would complement a lady and say she’s beautiful today and gorgeous the following day, for the sake of appearing different. The fact is, the two are entirely different and cannot be interchanged to mean the same qualities. 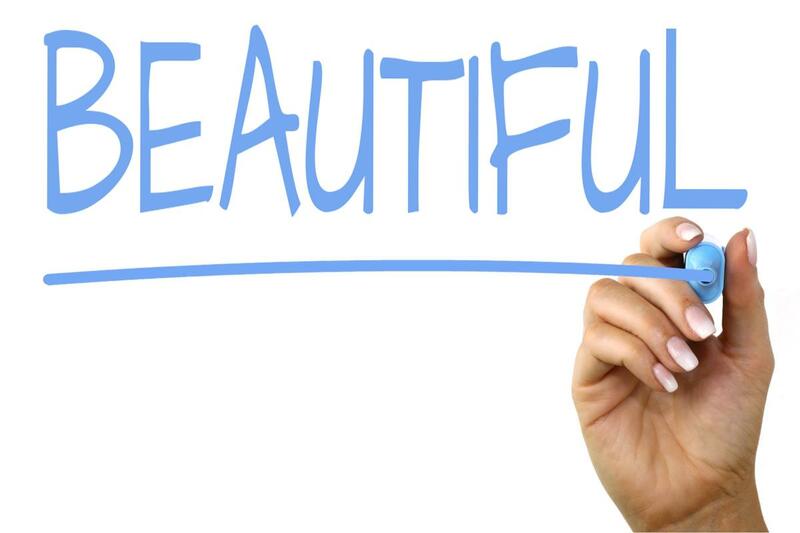 Beautiful and gorgeous might be used to describe things, actions, people, or ideas too or an expression of approval when someone brings forth a strong point. In the end, the two will be sending the same message that something looks or is good, but the parameters are different. Here are the definitions, differences, and possible similarities between the two terms. With the details, it would be easier to draw a sharp distinction between them. The word is used to refer to something, someone, place, or an idea that is aesthetically appealing. It does not, therefore, only refer to the outer beauty or physical attraction, but also something that is pleasing to the mind and senses. A good example is when one says a woman, house, photo, scenery, or poem is beautiful. Some of the items here may be regarded as beautiful because they are pleasing to the eye, but for the case of a woman and the poem, the qualities that qualify them as so may be different. The woman may be beautiful based on her character, and the way she interacts with people and they will say she has a beautiful heart. The poem, on the other hand, may be beautiful, not because of the structure, rhyming, or flaw of words, but because of the message in it. More often, the adjective beautiful is used on women. Even though most people use it to describe her physical appearance, a truer meaning should be what she has in herself as compared to how she looks on the outside. She could have a fairly beautiful and attractive from the outside, but she has a friendly nature. When a woman is beautiful, she enchants everyone. She will elude joy, passion, care, generosity, and love and these are the traits most people will want around a “beautiful” person. She also commands confidence and has accomplishments to show for while a gorgeous woman might not possess all those traits. Gorgeous is an adjective used to describe something or someone who is very attractive, good-looking, striking, or stunning to the eye. The person’s outward appearance could be irresistible and are hence referred to as gorgeous. A color, the weather, or photo could be gorgeous too, meaning it’s pleasant and enjoyable. Gorgeous, when compared with beautiful, is more reflective. However, it only relates to the outward appearance or that which attracts the eye. The adjective is used to describe or emphasize striking attraction, wonderfulness, stunning qualities, or a good-looking appearance. It may also be used to describe a delightful feeling usually regarding or towards a being. While the word beautiful focuses on the inside and outer appearance, gorgeous focuses on the physical attributes only. The two are adjectives and are used to describe something, someone, place, or feeling that is pleasant. Beautiful is an adjective used to describe someone or something that is aesthetically pleasing. That person or item can please the mind, senses, and the eyes too. Gorgeous, on the other hand, refers to something or someone who is strikingly stunning, magnificent, good-looking, or wonderful from the outside. As such, gorgeousness is about physical attributes. When referring to human beings, the adjective beautiful is usually used on women while gorgeous can be used on both men and women. 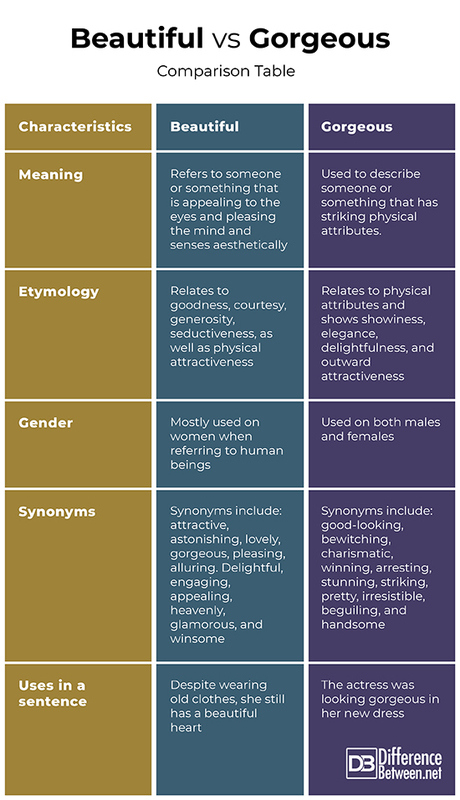 On etymology, the word beautiful etymologically relates to goodness, courtesy, generosity, seductiveness, and physical attractiveness. Gorgeous, on the other hand, etymologically relates to showiness, delightfulness, elegance, fashion, splendor, and physical attributes. Beautiful is used to describe places, objects, people, or phenomena while gorgeous is used to describe the physical features of people, places, and objects. Other words that mean the same as beautiful include attractive, astonishing, lovely, gorgeous, pleasing, alluring, delightful, engaging, appealing, heavenly, glamorous, and winsome. Synonyms for gorgeous include good-looking, bewitching, charismatic, winning, arresting, stunning, striking, pretty, irresistible, beguiling, and handsome. Beautiful means possessing beauty qualities yet with aesthetic pleasure to the soul, senses, and mind while gorgeous means possessing elements that are pleasing to the eye. The two terms, beautiful and gorgeous are adjectives whose main uses are to describe and appreciate the appearance of someone or something. However, a deeper application could separate the two and lay the differences. As such, beautiful refers to the outer and inner goodness of a person while gorgeous refers to the outward appearance. Sarah Brown. "Difference Between Beautiful and Gorgeous." DifferenceBetween.net. April 9, 2019 < http://www.differencebetween.net/language/difference-between-beautiful-and-gorgeous/ >. "Beautiful Vs Gorgeous | Difference Between The Two Words | Learnodo Newtonic". Learnodo-Newtonic.Com, 2019, https://learnodo-newtonic.com/beautiful-vs-gorgeous-difference-between-the-two-words. Ojumu, B. (2018). Difference between PRETTY and BEAUTIFUL | Passnownow.com. [online] Passnownow.com. Available at: https://passnownow.com/grammar-clinic-the-real-difference-between-pretty-and-beautiful/ [Accessed 12 Feb. 2019].